Please note that the trainers listed below are independent contractors, and are not employed by Advantage Software. Advantage Software cannot be held responsible for any issues that arise between you and your trainer. A C D F G I K L M N O P R S T V W Outside the U.S.
Notes: Will train beginners on up. 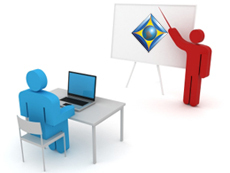 I provide FREE training and help to ALL Eclipse students anywhere. I do some small webinars for students also. Notes: Training available via Phone, Online & webinars also available. Will Travel To: Washington, D.C.
Notes: Basic & Intermediate Software & Steno Writers. Notes: Will consider travel to other areas. Notes: Editing efficiency through Auto Magic, macros, and hyperkeys; understanding user settings; Connection Magic setup. Group training at state conventions available. Notes: Online training, or one on one in Covington, LA. Notes: Remote training provided via Zoom meeting. Notes: Note: Will consider travel to other areas. Notes: 25 years as a court reporter & Eclipse user. I love teaching & training on Eclipse software & Passport writers, combining my two passions: court reporting & teaching. All Content ©2006 - 2019 Advantage Software. All Rights Reserved.